For years, proposed gun regulations in Olympia have stalled long before getting a full vote of the Legislature. OLYMPIA — The Washington Senate has approved a bill to ban bump stocks, the type of rapid-fire trigger modification that entered the national consciousness after last fall’s mass shooting in Las Vegas. The vote for Senate Bill 5992 on Thursday night came as a rare victory at the Washington Legislature for gun-regulation advocates. For years, proposed gun laws in Olympia have stalled long before getting a full vote of the Legislature. That inaction stands in stark contrast to the new gun laws Washington voters broadly approved at the ballot box in 2014 and 2016. On Thursday, four Republicans joined Democrats to approve the bump-stock ban, including Sen. Dean Takko, D-Longview, who previously said he was leaning against the proposal. The bill passed 29 to 20. Now it goes to the House, where a key lawmaker on Friday said it might have bipartisan support there, too. Takko, Republican lawmakers and some members of the public had worried the bill was written too broadly and would make illegal other personal modifications that gun owners can make to their firearms. The amended version approved Thursday included more language to define a bump stock. 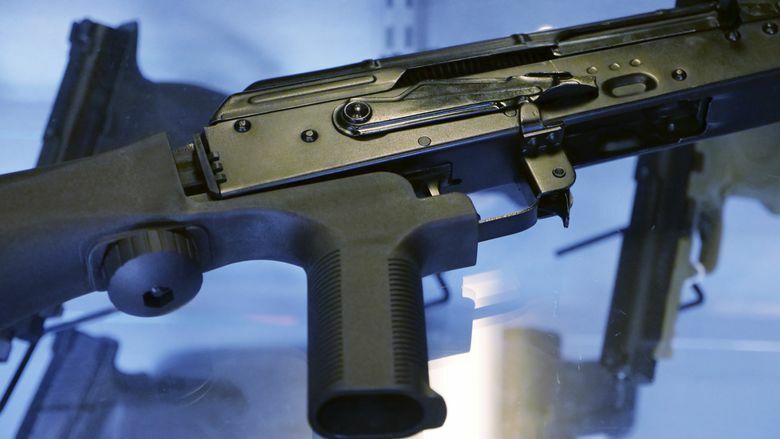 It bans the manufacture and sale of bump stocks in Washington, and also bans the possession of bump stocks beginning in July 2019, according to Sen. Hans Zeiger, R-Puyallup, who sponsored the amended version. 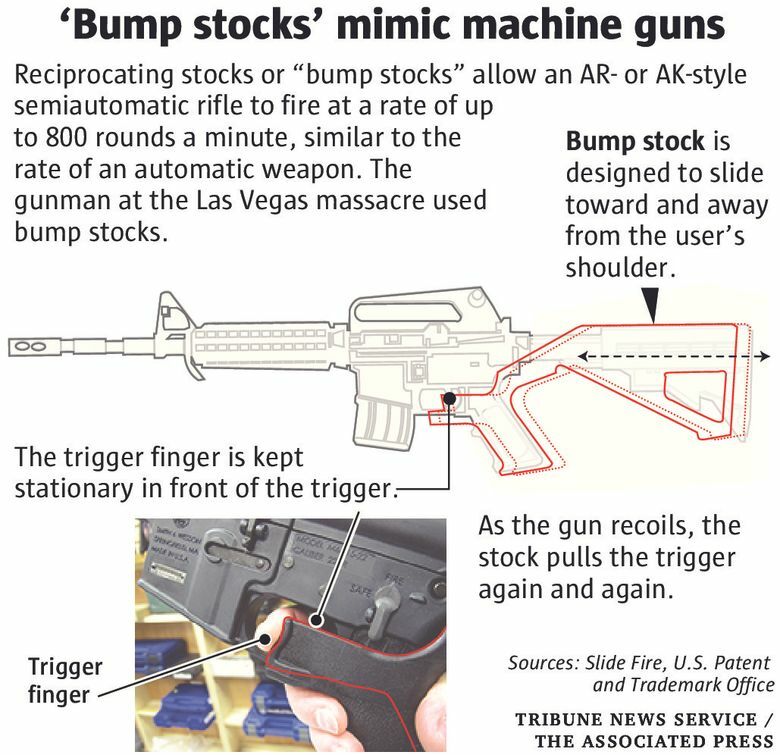 The Las Vegas shooter used semi-automatic rifles equipped with bump stocks to open fire from a 32nd-floor hotel room onto an outdoor music festival, killing 58 people and injuring more than 500 others. “Our state laws have never allowed for fully automatic weapons, whether you have a background check or not,” said Van De Wege, who described himself as a lifelong National Rifle Association member. Senate Minority Leader Mark Schoesler of Ritzville, one of 20 lawmakers who voted against the ban, viewed the bill in a darker light. Thursday night’s vote is half the battle in getting the ban to Gov. Jay Inslee’s desk for signature. Lawmakers will have to find enough votes to move the measure through the state House, where Democrats hold a slim 50-48 majority. Democratic leaders in the House haven’t publicly committed to giving the bill a floor vote. Rep. Laurie Jinkins, D-Tacoma and chair of the House Judiciary Committee, said Friday she intends to give the bill a committee hearing. Jinkins has to discuss the proposal further with Republicans, but she said there may be bipartisan support in the House for the Senate version. In conversations with lawmakers before the legislative session, Jinkins said some Republicans were open to a narrowly crafted approach like the one that ultimately passed the Senate. She would have preferred the initial, broader ban on trigger-modification devices, Jinkins said. But she would vote for this one. Gun-related bills previously have stalled in the House — or been stopped at the last moment. Like others who had concerns about the original proposal, one House Democrat has said he opposed the original bump-stock ban because it was too broadly written. About 1,000 people were in Olympia earlier this month for a public hearing on that bill and several other proposed gun regulations. Those other proposals include SB 6049, which would ban high-capacity ammunition magazines, and SB 5444, which would require enhanced background checks for the purchase of so-called assault rifles. Those enhanced checks would be similar to the present requirements for buying a handgun. Legislators also heard comments on SB 5463, a bill to promote the safe storage of guns in homes.